The modernization of public services is high on the political agenda and the role of Information and Communication Technologies in this process has been increasingly recognized. In current practice, however, conventional services have just been “digitized” without any concern for their actual impact on society. 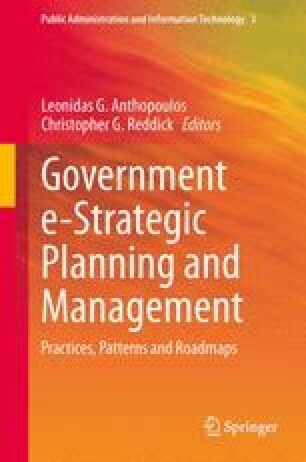 After over 20 years of research and practical implementation it is now widely recognized by both the scientific and the practice communities that despite the potential of e-government, the evidence of its impact on society is still very limited and the promised productivity gains seem not having been achieved yet generating the so called “e-government paradox”. The chapter builds on recent work of the authors (Savoldelli et al. 2012) who have analysed which are the main barriers hindering the adoption of e-government services and suggested that, in most mature public administrations, the key barriers generating such paradox can be identified in an unstructured policy evaluation process and in the absence of effective stakeholders’ engagement mechanisms. Starting from these findings, the chapter explores the existing relationship between measurement and trust on e-government decision making processes. The methodological approach underpinning the analysis is based upon a critical review of the most known and adopted e-government measurement frameworks. As a result of the analysis a proposal of a new framework capable of measuring the public value of e-government is presented and its application in a real context of usage provided by the Informatics and Telematics plan of the last 3 years of the Emilia Romagna region in Italy is discussed. Disclaimer: The views expressed in this paper are purely those of the authors and may not in any circumstances be regarded as stating an official position of the European Commission. Guida, J., & Crow, M. (2008). E-government and e-governance. In T. Unvin (Ed. ), ICT4D – Information and communication technologies for development. Cambridge: Cambridge University Press. Retrieved January 18, 2012 from http://books.google.com. Sheridan, W., & Riley, T. B. (2006). Comparing e-government and egovernance. Available at http://www.inst-informatica.pt/servicos/informacao-e-documentacao/biblioteca-digital/gestao-de-si-ti-1/it-governance/SheridanRileyComparEgov.pdf. Last retrieval on February 7 2012. Titah, R., & Barki, H. (2005). E-government Adoption and Acceptance: A Literature Review, Chaire de la Chaire du Canada en implementation et gestion des technologies des information. HEC Montreal. Available at http://neumann.hec.ca/igti/cahiers%20de%20recherche/chaireIGTIcahier0503.pdf. Last retrieval: January 20 2012.